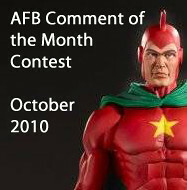 AFB Sees Stars in a Special Birthday Month - October Comment Contest! First off, thanks to everyone who commented on last month’s blog posts. Congratulations to evilwilma for being our randomly selected winner! Once we hear from Wilma, his choice of either the Marvel Universe Thanos figure or one of the Venture Bros Retro Style figures will be on the way when available from Mike’s Comics N’ Stuff. Now to October’s Contest, and it's a bit special, as AFB (the guy, not the blog) is turning 40 this month, and I intend to party to celebrate! : On offer are two great prizes, either the Ted Knight Starman or Jack Knight Starman figures from DC Universe Classics Wave 15. 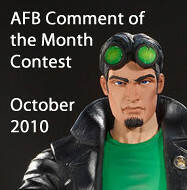 This month, as well as one comment from an October blog post being selected for a prize, one AFB Facebook Fan will also receive an October prize, so if you're not a fan of AFB on Facebook, become one now! Once again, thanks to Mike for making this all possible for us, and here’s to another happy month of commenting, and a very happy 40th to me! I'm not collect any figures but only focus on miniature diecast on F1 car , rally car & street car. I do test drive as well & write about the feeling towards the car i tested. But i'm interested so what is the basic requirment? But i really like your collection because it just awesome. Congrats Evilwilma! Tough choice for figures, which did you decide on? The October contest sounds awesome! I'd love me one of those sweet, sweet Starmen...that really doesnt' sound right. Welcome to the 40-and-Over Club, youngster. I've been saving you a seat. Wow! Soon the hearing will go and the frequency of bathroom breaks will increase. But all the best and all that! Well done Wilma! Drop by the forum and have a chat! Whee! I wanna Venture Brothers figure! (Derek doesn't get that show.) But, which one? I think I will pick Doctor Venture himself, if that's okay. I think it would be funny to have a toy of a bald glasses-wearing nebbish in a mauve jumpsuit.